It is yet another plaid shirt, this time with beige (or tan) lines and subtle hints of blue. The plaid on the pockets runs diagonal, and once again we have snaps, not buttons. Brand Information: American Eagle (an alternative colour version of Sam's Dull Plaid Shirt). 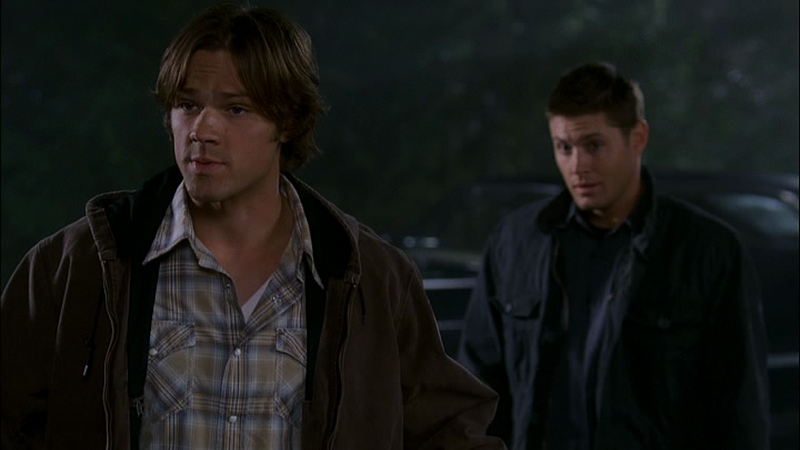 In Red Sky At Morning (3x06), Sam wears this when he and Dean watch the guy who they think might be the next victim of the ghost ship (they are correct.). He changes out of it the shirt after the guy dies. In Dream A Little Dream Of Me (3x10), Sam wears it once Bobby wakes up, and then changes out of it once Jeremy is dead. In Long Distance Call (3x14), Sam wears this shirt from the beginning of the episode until the point where we see him sleeping, while Dean takes his “father’s” call. In Changing Channels (5x08) Sam wears it when he is in the sitcom. In Adventures in Babysitting (7x11), Sam wears it when he and Dean bid farewell to Crissy and her father at the end of the episode. In Bitten (8x04), this may be the shirt that Sam is wearing when he and Dean are caught on camera killing the professor. In Remember the Titans (8x16), Sam is wearing this shirt at the beginning of the episode while drinking water in the Bunker and then talking to Dean. 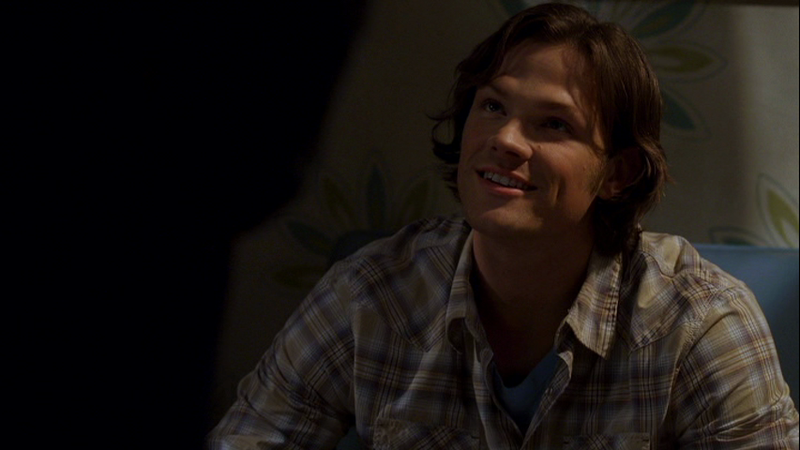 In The Hunter Games (10x10), Sam wears this shirt for the entire episode. In Red Meat (11x17), Sam is wearing this shirt when he gets shot in the cabin. He continues wearing it until he makes it to the hospital. FATE: Sam gets shot in the abdomen while wearing this shirt in Red Meat (11x17). The bullet enters just underneath his left ribcage, towards the sternum. 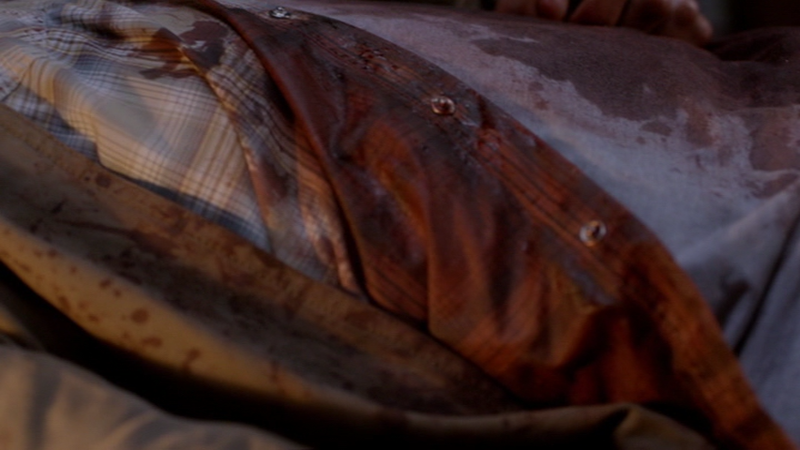 The shirt gets very blood-drenched throughout the rest of the episode.